1/2 Cup of Shredded Cheese. I used Swiss because it is the best. Slice the onions and saute in oil (I used coconut oil) for at least half an hour on a low temperature until they become brown and caramelized. Cut the cauliflower into florets and arrange on a baking pan. Sprinkle with salt and pepper and bake at 350ºF for about 30 minutes. When the cauliflower has become aromatic, slightly toasted and translucent, remove from the oven and let cool. Then chop finely. Mix the flour, polenta mix and spices thoroughly and add the butter, mixing thoroughly. Mix in eggs one at a time. Add a few tablespoons of water if necessary. Press the polenta mixture into a glass pie dish. 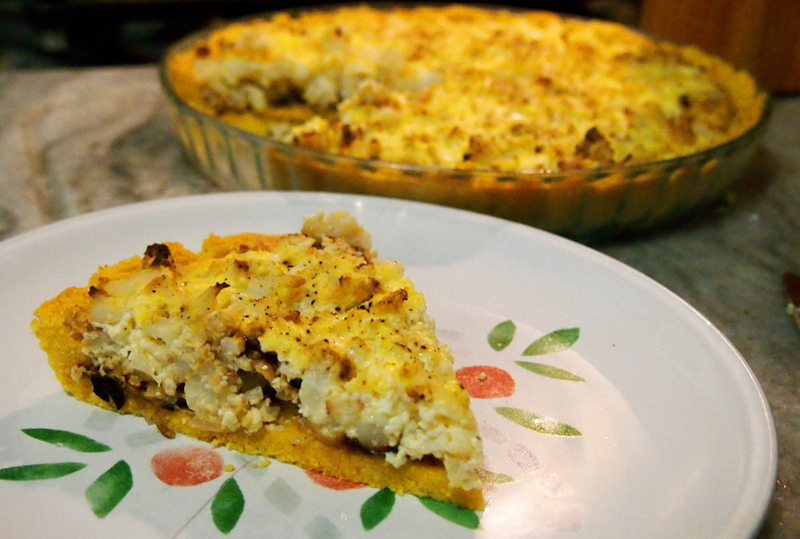 Spread two tablespoons of mustard evenly on the bottom of the pie crust and then layer the caramelized onions on top. In a bowl, mix the cauliflower, milk, ricotta, eggs and shredded cheese. Season with salt and pepper and then pour over the caramelized onions. Bake the tart at 350° for 30 minutes, or until a knife inserted into the middle comes out clean. Enjoy! That looks absolutely delicious ! ! ! ! I wanna try it !